Upcoming Sci-Fi Revoltech – Gotengo! According to the December 2011 issue of Dengeki Hobby, Godzilla fans are in for another treat in Kaiyodo’s Sci-Fi Revoltech toyline. This time, we get not a monster but the infamous boring, flying submarine Gotengo! Better known to Western fans as the Atragon, the Gotengo has appeared numerous times since its titular appearance in 1963, from finding the undersea kingdom of Mu to its appearance alongside Godzilla in the 2004 film Godzilla: Final Wars, to its cameo in the film based on the Toho series Sazer-X. Could a Revoltech of the Mu guardian-serpent Manda be far behind? 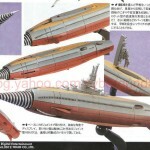 The Gotengo, entry number 34 in the Sci-Fi Revoltech series, is slated for a January 1, 2012 release at 3500 yen.